Welcome to How to draw faces. – In this series of tutorials dedicated to the drawing of the human anatomy we will dedicate time to study and draw the human features. 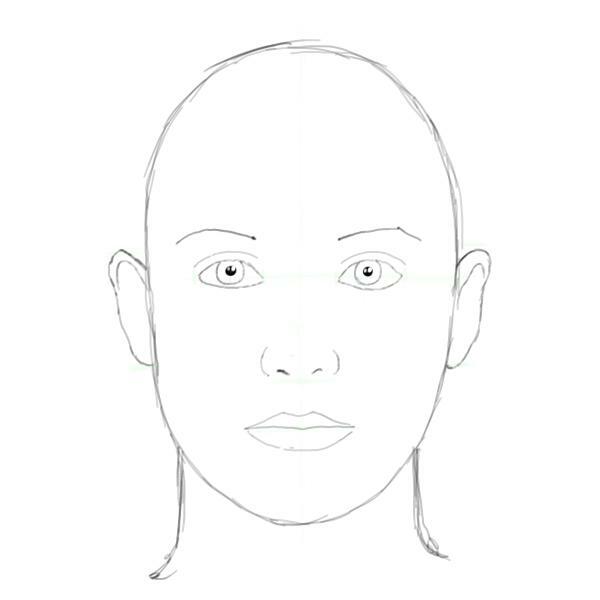 In this specific tutorial we’ll be looking at how to draw compelling faces using an internal reference system to get the proportions right every time. 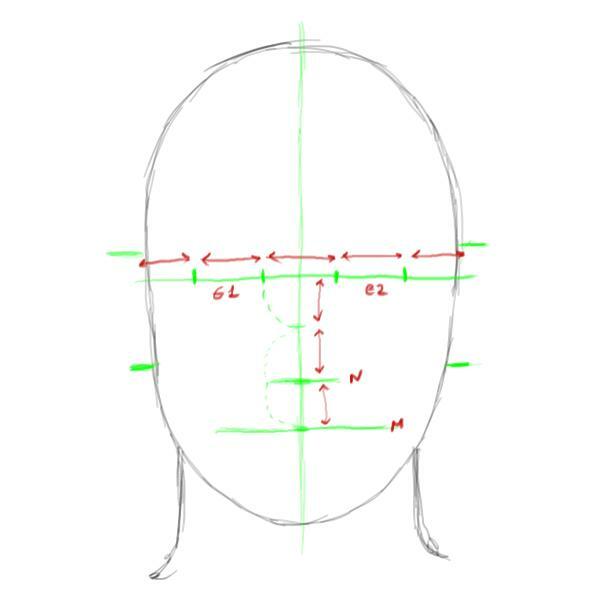 The method we are going to show you is very simple, really no rocket science, however with a bit of practice you’ll be able to draw faces with the right proportions without using external reference or complicated constructing grids. The face is the feature which best distinguishes a person, and there are “special” regions of the human brain, such as the fusiform face area (FFA), which when damaged prevent the recognition of the faces of even intimate family members. 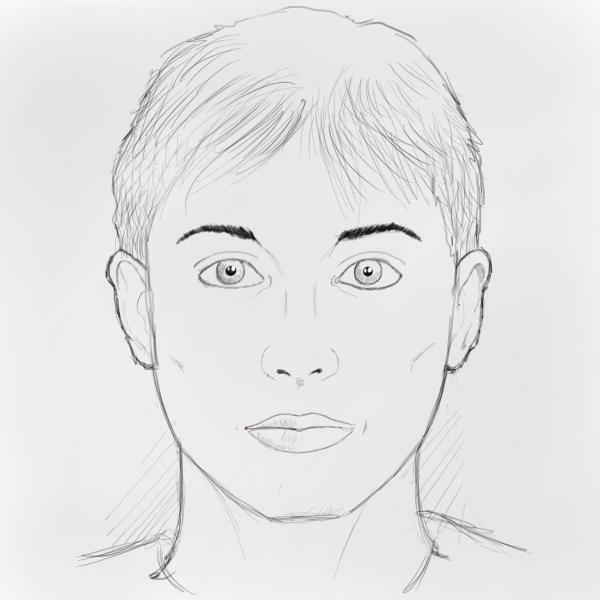 How to draw faces – Let’s get started! 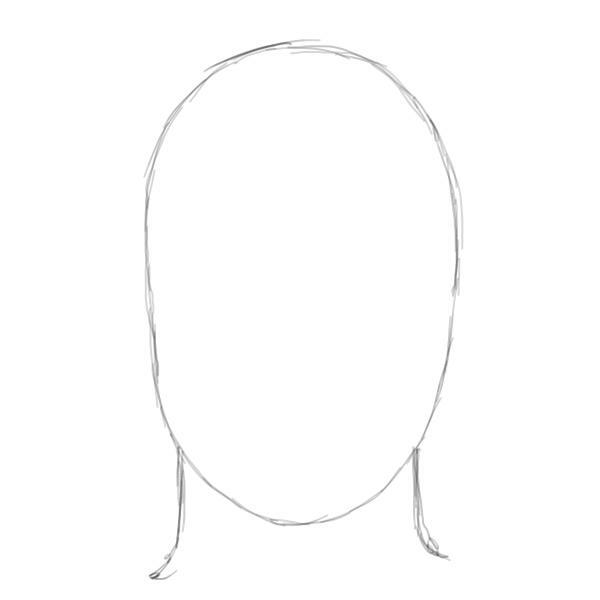 Let’s start by drawing a simple face oval and sketching a neck below it. To draw the oval correctly imagine to be drawing an egg shape or take a circle and stretch it along one of its diameters. Now it’s where the funs starts. Trace an horizontal line right in the middle of the oval (green long line). This will be where the eyes will be placed. Divide that line into almost five equal segments. The segments e1 and e2 will be the place to position the eyes. Now the length of the eye s in the human face an excellent unit to position and scale all the other elements of the face. In fact the nose line is exactly distant from the eye line two eye units. See where the letter N is in the drawing? Then the mouth line is distant one eye unit from the nose line. So the mouth line is in face three eye units from the eye line. Ears are approximately two eye units long and are positioned at the sides of the head right at the middle of the oval. it’s not finished yet! 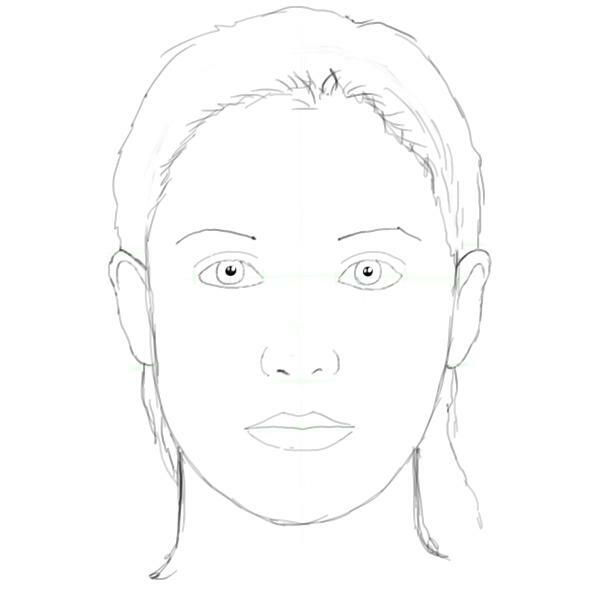 You’ll see how handy the eye unit will come to define other proportions of the face. If you look closely at the drawing below you’ll see that the width of the nose is exactly one eye unit and that the width of the mouth is exactly two eye units! Isn’t that handy? Once you have defined all the relevant proportions drawing the face becomes an exercise in filling the spots that you have been so carefully planning. 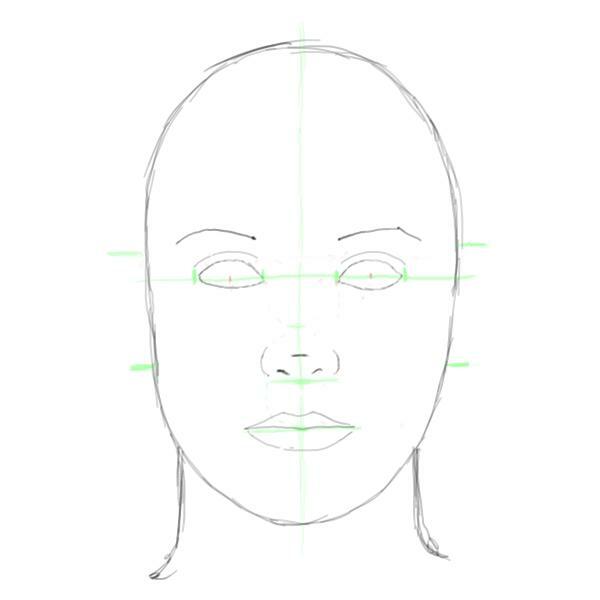 Draw the appropriate shapes of the eyes in their sockets and also sketch the nose tip and the mouth lips. Eyebrows are approximately one eye unit above the eye line. 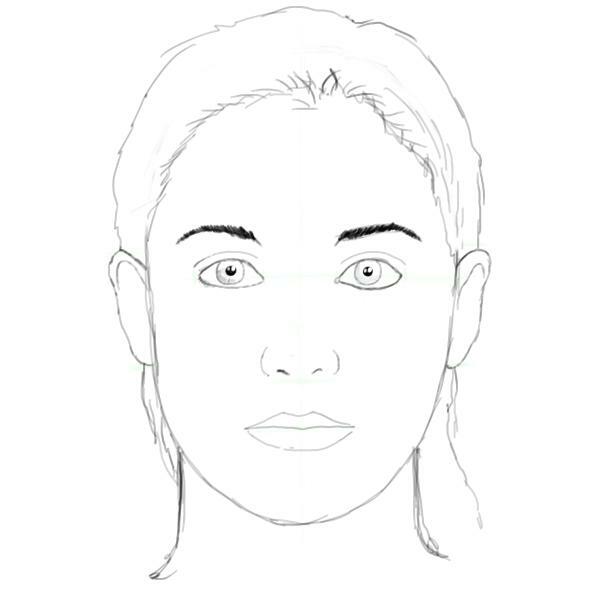 Now draw the ears, the pupils and clean your drawing from unwonted construction lines. Keep in mind though that there is no such think as a perfect or average face. All face are different and all these guidelines serve only to start practicing and honing your skills but that the beauty of a face is given not just by uniform positioning of the facial features. I have just sketched in a bit of hairs to have a better feeling on how the face drawing is coming along. We’ll be modifying the haircut further along the tutorial. To complete the drawing at this point you want to add in more detail like, for example the eyebrows or the nostrils. Also keep in mind that at this stage the appearance of the face is still quite plastic and can change easily with a few strategically positioned lines. 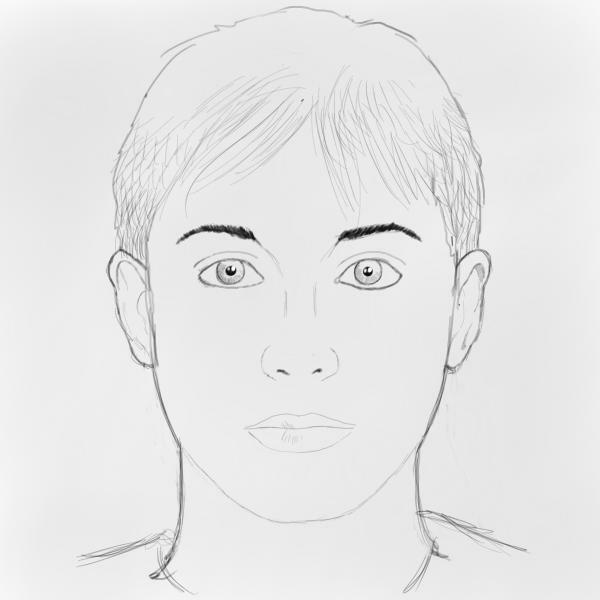 A it of detail on the nose and a modern haircut make this face appear as that of a young male. Ad more details like the iris and a few lines at the bottom of the nose and on the lips. Overall drawing has been consolidated in this last step. At this stage, that I call consolidation, you can’t changed dramatically the features of your drawing anymore so before finalizing be sure you like what you got so far! 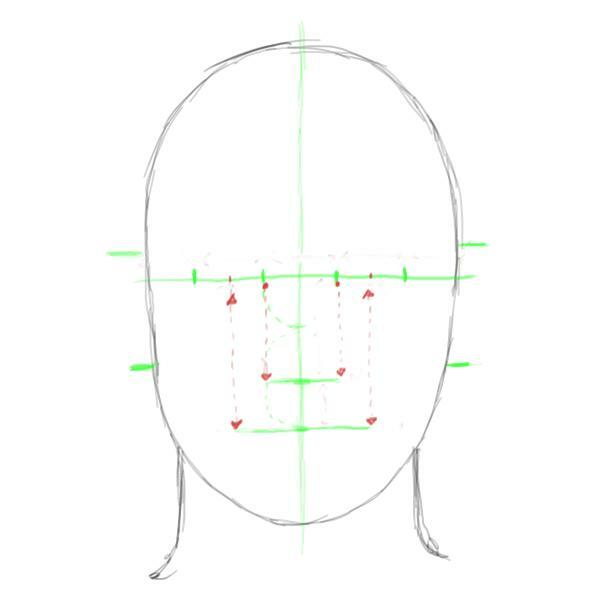 How to draw faces – The finished result! And there you have it! A face drawn from scratch using only internal reference. Brilliant! We really hope you enjoyed this tutorial! If you liked It, there are many ways you can make US a big favor. Spread the word about our site to your friends and family, Link to this site or tutorial if you have a blog or website or bookmark it and share your favorite tutorial using the network social tool you prefer. That would be really cool! Do not forget to leave a comment if you feel like it 🙂 We would love to hear from you!